1 Clubcard point is worth 2.4 Avios or 2.5 Virgin Flying Club miles. Full details are on Shopper Points here. You can also see the sets available on the Tesco site here. Does ALDI now take Amex? It looks like ALDI is starting to target American Express cardholders. There have been rumours about the discount supermarket starting to accept Amex but as we couldn’t find anything online, I got on the tube. 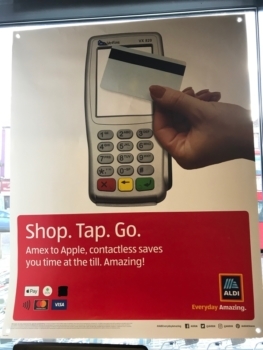 As the picture above shows ALDI is promoting contactless payment with Amex but the Amex icon has been covered with black ink for now ….. The cashier told me that Amex should be accepted from February, but she couldn’t confirm a date. (I had to use my Mastercard to pay for the German bratwurst). Others have been told that 1st February is the launch. Thanks to the two readers who tipped us off. The newly refurbished Plaza Premium lounge at Abu Dhabi International Airport Teminal 1 has re-opened and here are a few pictures. Here is the official website, where you can also book a slot. With a 47% increase in seating capacity the Plaza Premium lounge can now host 300 people. As well as sitting areas the lounge features a family room, an all-day dining room, business amenities and massage facilities. Entrance on the door costs AED200 per person for two hours or AED350 per person for five hours. You can pre-book access here. You can also get in with Priority Pass or Lounge Club or by showing an American Express Platinum card at the door. OT – bought two one for all post office gift cards when the AMEX £5 back offer was on. Long story short I have had a mare getting them accepted in two M&S stores in Leeds so needed up getting them (thankfully the full £20) refunded direct to my bank account, after having to go back and forth to the customer service email. What a shame! I am surprised to hear that. As well as the Post Office offer, I buy One4All all the time as I can buy them at 6% discount. I am sure that I have used them at M&S and definitely at John Lewis (including café), Debenhams and TK Maxx among others. Did you swipe the card or try to scan the number. The only slight glitch is that they ask for a signature but there is none on the card to compare but this has never stopped use. Tried to swipe the cards but to no avail. On a number of visits not one employee recognised the card or knew what to do with it. Oneforall said that the issue was that the merchant number differed to what they had on their approved system, and then when I tried (and failed) again, that it again differed…so basically they blamed M&S and M&S said they didn’t recognise the card. The two M&S stores were main stores – hey ho. I don’t shop in Boots unfortunately. M&S is no longer in Curve rewards as of a couple of months ago. I’ve got a banner at the top of AMEX promoting the Aldi news. Yep, same here. I guess that’s confirmed then. Just paid for two bags of shopping with Amex at Aldi, so yes, I can also confirm that it works. I shop there regularly, not least because the cats insist on Aldi – they will not touch Sainsbury’s, Morrisons, Tesco, Lidl or Asda. But also because I like Aldi, though they have dropped a lot of the European stuff that they used to have. But, as Rob mentioned, their Thüringer Bratwürste are still good. I much prefer Lidl, and have a Tesco Clubcard credit card that is used almost exclusively there. Let’s hope they follow and add Amex, it’s a big chunk of my spend! Probably an amex offer coming soon as tgey have a track record of media offers. One thing I find slightly annoying with Amex is Android pay, and contactless. Often places that say they take Amex and Android pay reject payment. Try the actual card contactless and it may work, if not do a full chip and pin and it almost always does. Sort of defeats the so called convenience of Android pay and contactless. Is this retailers, Android, Amex, my card or something else. It’s almost always smaller retailers like pubs. Never a problem in Pret, supermarkets, Eat etc. AFAIK, when contactless works with Visa/M’card, but not Amex, but Amex does work on chip+PIN, it is simply because the retailer has not realised that they have to configure their terminals separately for contactless Amex, as well as contactless Visa/M’Card. Wilko for one I always have to use Chip+PIN. I would guess that the same may apply to pay-by-phone, but since I do not have that sort of phone, that one is not a problem for me. Amex contactless always failed in my local Cafe Nero, but Chip & Pin was OK. Today I was told that they have new terminals that now take Amex contactless – and it worked! Maybe they are just configured properly as you suggest. They are just trying to make it clearer what 20k points gets you. No matter, scrub the above – apologies. My pet dog is looking forward to buying some gift cards. Is that even if you used the offer last year? Found it on Avios site. It just reappeared. Look on avios.com. We had an article on it for today but it got pushed back, and has now been pushed back from tomorrow due to the Nectar story. Talking of nectar, it is swipe and win weekend, I take it Anika knows for SP tomorrow? It has been very quiet. Does your dog need its own Avios a/c? Each adult has their own avios account, linked to their respective BA account. The avios accounts are not not part of any family account. and then this spare avios account, What is the process to absorb it into the fold? probably easiest to just transfer the points to your BAEC account. That is what I do with my ‘spare’ Avios account which is useful sometimes. 4500 is a one way eco redemption to many places, could use them that way. @Russell, I cannot speak for anybodies dogs, but your nanny might benefit from her own account! I think your Nanny needs to be over 18 to sign up. This discounts most Nannys in Europe.l! Amex website advises that Aldi now accept Amex Cards. I hope the Aldi news is true, but Googling for it reveals nothing, and the Amex UK web site isn’t terribly usable. Aldi is one of the few remaining places I go that don’t take Amex. I used it today and it worked fine! Thanks for confirming. I’ll try it out in Manchester at the weekend. Great news about Aldi and Amex. I can now earn Virgin miles on all my shopping. I hope Lidl follow suit – we have 2 Lidl stores nearby, but the nearest Aldi is much further. It’s also relatively new (about 1 year) and there are no others for miles. Check your Amex accounts – I just got an offer for £5 off £10 spend, and you have until April to use it.